Business Image Printing has offered the full line of the custom cookie boxes. The cookie packaging just happens to be one of our most in demand and popular products to date, and for good reason as well! The presentation of your product is a crucial aspect of getting customers to purchase it in stores, and what better way is there to sell products than with your very own custom packaging. 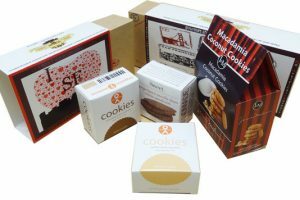 With us, you’ll have a multitude of options to choose from for your custom printed cookie boxes like our popular rolled-two-side tuck end boxes that are easy yet classy, or our more unorthodox hexagonal designs for a more unique look of your product. We give you full creative space in designing the perfect packaging for your taste as our team of experts are readily equipped to help you create practically anything you can imagine. In the end, our goal is to make sure that our clients will leave satisfied with their new custom printed boxes and glad that they chose us to create custom packaging for their product. If you are looking for even more customization packaging, our team is glad to make your product stand out among the competition by adding a matte coating to your product boxes for that softer feel, metallic foiling to the packaging in order to add a elegant and artistic element to your products, or die cut window so that your product can be displayed physically rather than through an image. Just request what additional features you’d like to see on your boxes, and we’ll give you the cost! In this industry, it is crucial to have outstanding and eye-catching packaging in order to catch your customer’s’ attention. We try to make that possible in an easy process with competitive pricing by showcasing our expertise, experience, and state of the art technology available to our clients.